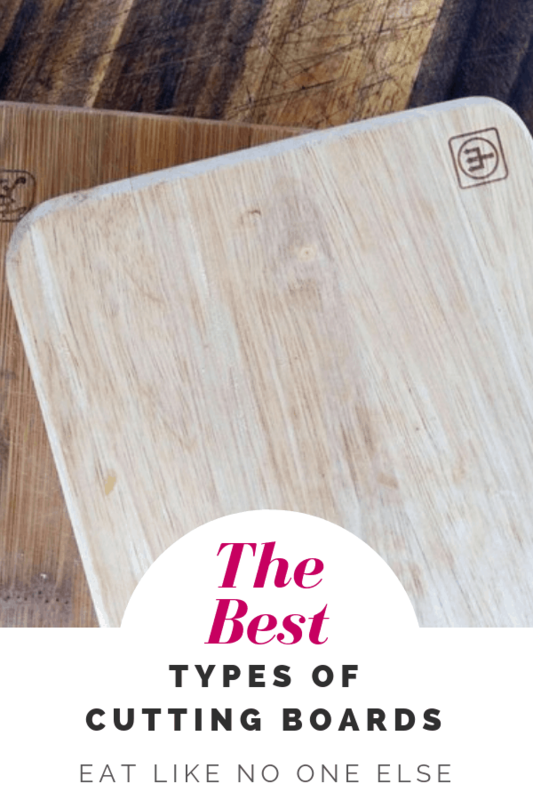 The cutting board – the best friend of the knife (or it’s worst enemy?) is an essential tool that every kitchen needs. But not just any cutting board will do. There are numerous cutting boards available today. Let’s take a look. 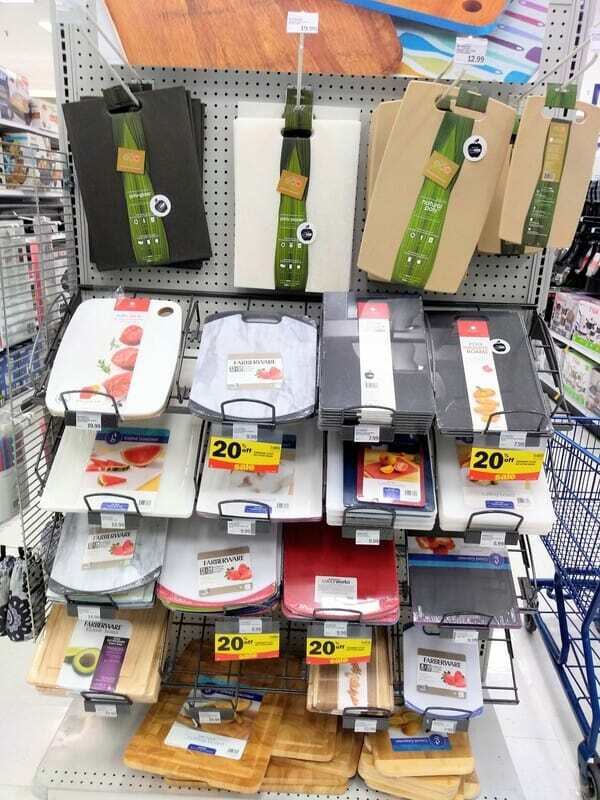 This is just one section of cutting boards available at my Meijer store. There are more around the corner. Look at all of those choices. How can one choose? For cutting board advice I follow the wise counsel of Alton Brown. He has given some great cutting board tips over the years on his show, Good Eats, and in his book, Gear For Your Kitchen (the perfect gift for the young cook or married couple). 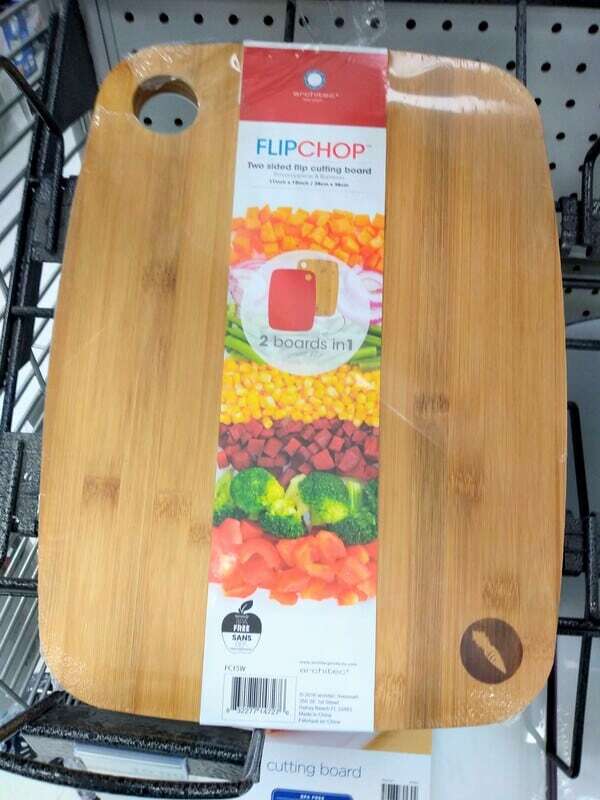 This Flip Chop cutting board is wood on one side and plastic on the other. These the two materials best for cutting boards. As important as it to choose the right surface, it’s of the upmost importance not to choose the wrong surface. I learned from Alton to say NO to glass. You should stay far far away from glass cutting boards. Although they may be pretty and easiest to clean, they will do a number on your knives. The surface of the glass will cause your knives to dull and dull knives means you need to put more pressure to use them. You are more likely to hurt yourself using a dull knife than a sharp one. Metal, granite, and marble also are very pretty, but will dull your knives. Don’t be tempted to cut anything directly on your granite or marble counter tops or on your sheet pans. I own these three different sized wooden cutting boards. So that leaves us with plastic and wood. What does Alton say you need? They both offer advantages and you need both in your kitchen. I use both in my kitchen nearly daily. When it comes down to it, wood really is the best surface to cut on. The surface of the wood makes it a fast surface for chopping and dicing on. Try chopping an onion on wood, then on plastic. You will notice through your tears that the job gets done faster on the wood. What Type of Wood Cutting Board Does Alton Recommend? On an episode of Good Eats, Alton Brown mentioned that his favorite type of wood cutting board is made of rock maple. It’s not cheap, but it’s a good investment that with the proper care, will be with you for a long time. What’s The Problem with Wood Cutting Boards? Here is the problem with wood – dealing with raw meat. It’s easy for the wood to pick up bacteria that you will not enjoy along with your food. For raw meat Alton and I (he has no clue who I am despite my comments on his Instagram account) use plastic. My favorite plastic cutting board is my Oxo Good Grips board. It is. HUGE – 21 inches x 14.5 inches. I can use it for carving something as large as a turkey on. These are the two plastic cutting boards I mainly use. The big one is perfect for carving huge hunks of meat, like ham or turkey. The small plastic cutting board is great for smaller jobs when I don’t want to break out the big guy. Why Not Just Use Plastic Cutting Boards? The downfall with plastic boards is that when they get deep cuts in them, you can’t sand them like you would with wood. When the cuts are too deep you really have to buy a new one, as it’s important to get them perfectly clean and free of bacteria. Also, as I said, it’s slower to do your chopping on plastic than wood. Once you have your cutting board, it’s important to take good care of it. Clean your boards with soap and water after every use. Once in a while it’s good to take some white distilled vinegar and rub down your board (whether it’s plastic or wood). Rinse the vinegar off and let the board air dry. You can also put plastic boards into your dishwasher. Never do that with wooden boards, it could cause them to warp or dry out and crack. Over time your boards will get cuts in them. That’s natural. With wood you can use some sand paper and smooth the surface back out. Make sure you sand it with the grain. Then apply a coat of food grade mineral oil. 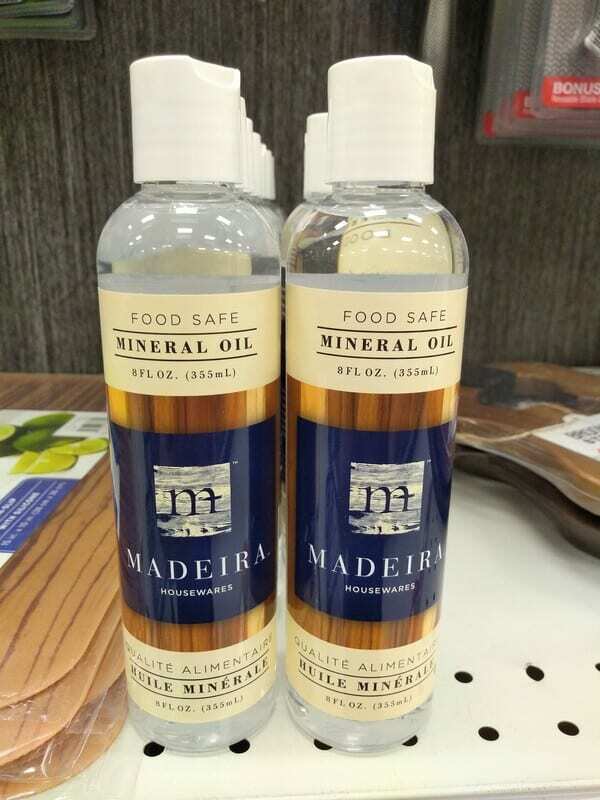 If you are going to use mineral oil with your wood cutting boards make sure that it is food safe. I hear you can use coconut oil as well because it won’t go rancid. You don’t want to use any oil that could go rancid on you. I love these flexible plastic cutting boards. Not so much for cutting on but for using to transport ingredients. 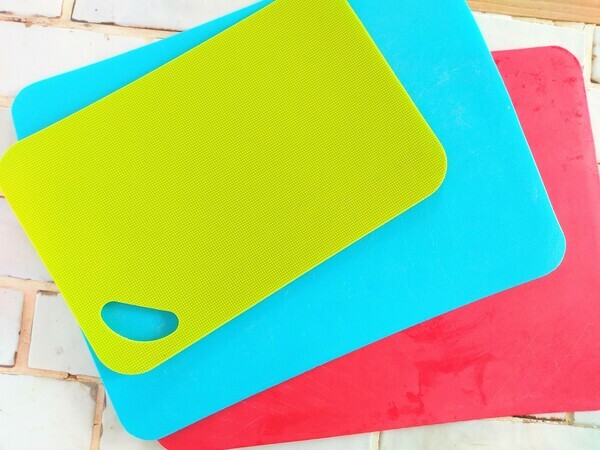 Should You Buy Flexible Plastic Cutting Boards? 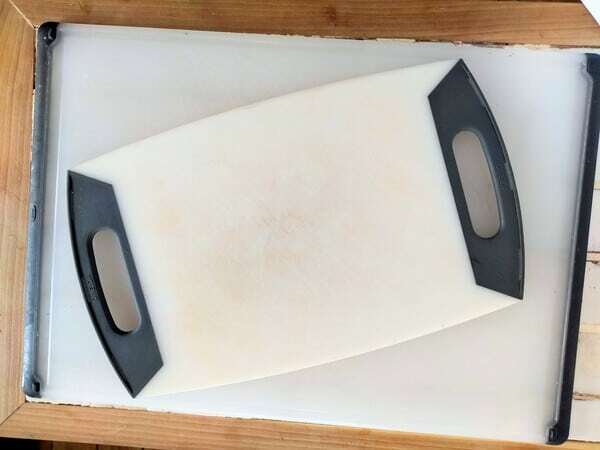 I first learned that flexible plastic cutting boards were a thing by seeing Alton use them on Good Eats. He wasn’t using them to cut on. Nope. Alton uses them to move ingredients. You fold them up to add flour to stand mixers. They are incredibly useful for moving ingredients without spilling. As a cutting surface, I don’t like them, as they are too thin and don’t hold up very long. I do like using them to bring food to the table, like freshly baked rolls. They can be used sort of like a plate, that you can fold up and take to the table. My kids also like using them for Play Dough. They make their creations on the flexible boards instead of directly on the table. It makes for easier clean up. 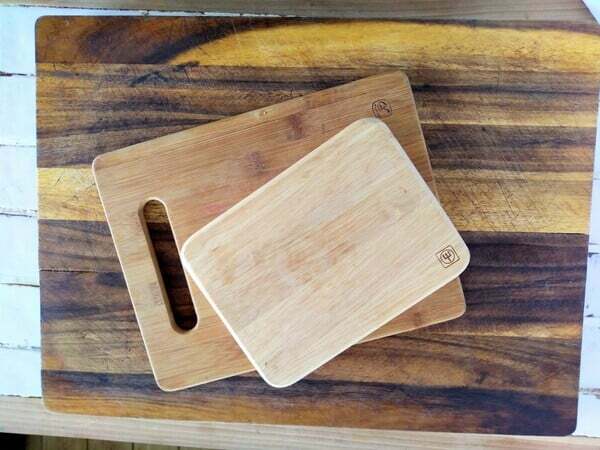 What cutting boards do you have in your kitchen? Leave a comment below, we would love to hear from you. Previous Post: « Can You Deep Fry Precooked Shrimp?